In this elegantly written book, Lee Wandel discusses the relationship between the reform of poor relief and the Protestant Reformation in early sixteenth-century Zurich. In the introduction she traces the various ways that poverty has been evaluated, and its social and religious connotations, up to the sixteenth century. 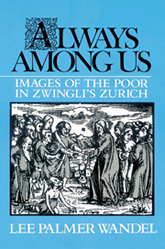 After providing a portrait of sixteenth-century Zurich, the author goes on to explore the discussion of the poor in various media of the town: the sermons and pamphlets of Huldrych Zwingli, who was preaching that the poor were the true images of God; printed images depicting Christ calling beggars and other poor folk to Him (these appeared on title pages of Zwingli’s pamphlets); the language of legislation (in particular the poor ordinances of 1520 and 1525). By exploring each of these different “languages”–the words of Zwingli’s sermons, the visual images of title page prints, and the language of legislation–Professor Wandel restores the complex perception of the poor in Reformation Zurich. In each, the poor were located within matrices of religious and social values and were seen as both economically dependent and symbolic within larger theological and ethical constructs.